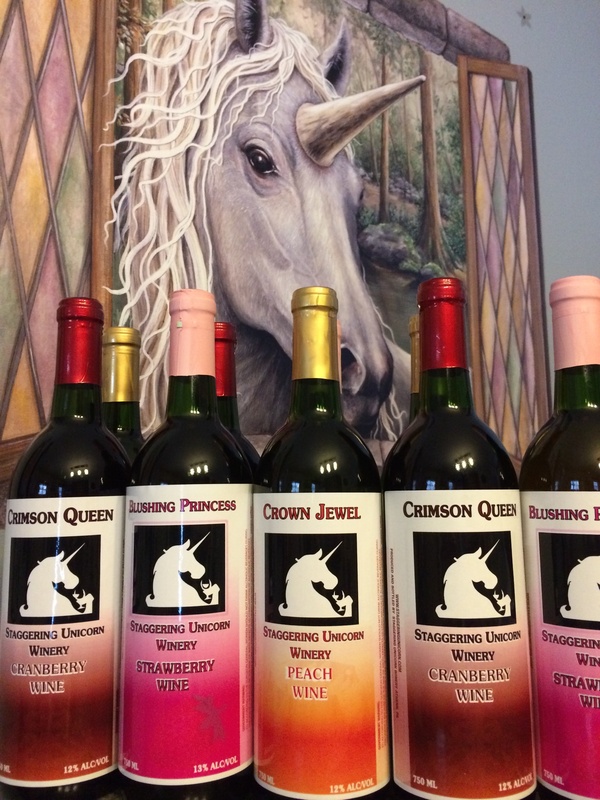 This week, our ‘Winery of the Week’ is Staggering Unicorn Winery. Relatively new to Bradford County, Staggering Unicorn Winery has already become a favorite primarily due to its endless list of unique flavors that would almost make one think it were an ice cream parlor rather than a winery. Owned and operated by Frank and Christy Maffei, the Litchfield Township winery offers fruit flavored and herb-infused wines that set it widely apart from the typical tasting. “We started making wine in our home out of fresh picked blackberries. Having great success with this wine, we decided to expand on flavors and now we make several varieties,” said Frank. It wasn’t long before the Maffeis’ decided to turn their hobby of winemaking into a full fledged business. Making all of their own wines and bottling them on the premises, Frank and Christy sample their varietals in their Litchfield Township tasting room. While it is located in Litchfield Township in Bradford County, the physical address of Staggering Unicorn is 10952 North Rome Road in Athens. Frank said the customer favorite and top-selling wine is currently the “Happily Ever After,” which is a pineapple and strawberry flavored concoction. Other Staggering Unicorn flavors of wine include mint, ginger, plum, cherry, lemon, pomegranate, coffee, cinnamon stick, and many more. Despite all of these flavors, Frank and Christy continue to produce all of the wines by themselves. “We are currently the only employees with the exception of when we attend festivals and other events. We are blessed to have family members and friends help us when we need it,” Frank said. Last year was the first time Staggering Unicorn sampled its wines at the Wyalusing Valley Wine Festival and it made quite an impression among attendees.